In a high speed food processor combine cacao and brown rice crisps, pulse until mixture is medium-fine consistency. Add honey, 1 tablespoon coconut oil and merjool dates to blender. Transfer mixture into a 6 inch spring form pan and press firmly into bottom to create the crust. Combine water, salt, cashews, peanut butter, maple syrup, lemon juice and 6 tablespoons coconut oil in a food processor. Process until mixture is smooth and creamy, scraping down the sides as you go. Spoon mixture into spring pan, spread evenly. Freeze for a minimum of 4 hours before serving. Line a small cupcake tray with mini cupcake liners. Pulse rice crisps in a food processor until a medium-fine consistency is achieved. In a mixing bowl combine peanut butter and rice crisps. Add 1 tablespoon maple syrup and salt, stirring well. In a small mixing bowl combine 1/6 cup maple syrup, cacao, and coconut oil. Spoon chocolate mixture into bottom of liners. 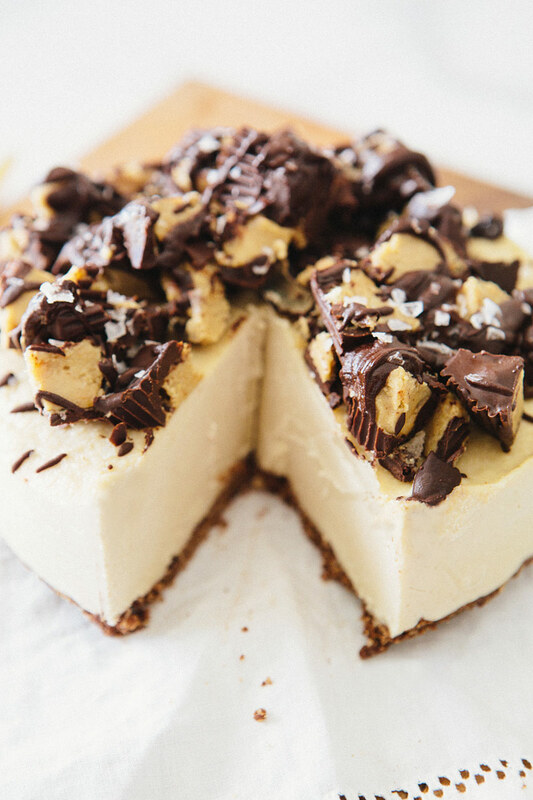 Scoop out a small-medium size spoonful of peanut butter mixture and place on top of chocolate. 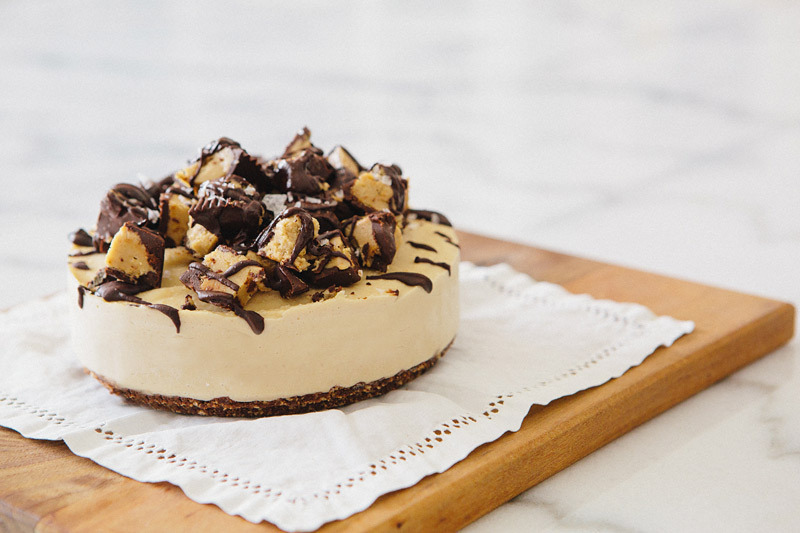 Cover peanut butter with more chocolate. Sprinkle the cups with Maldon salt and freeze for at least 3 hours. 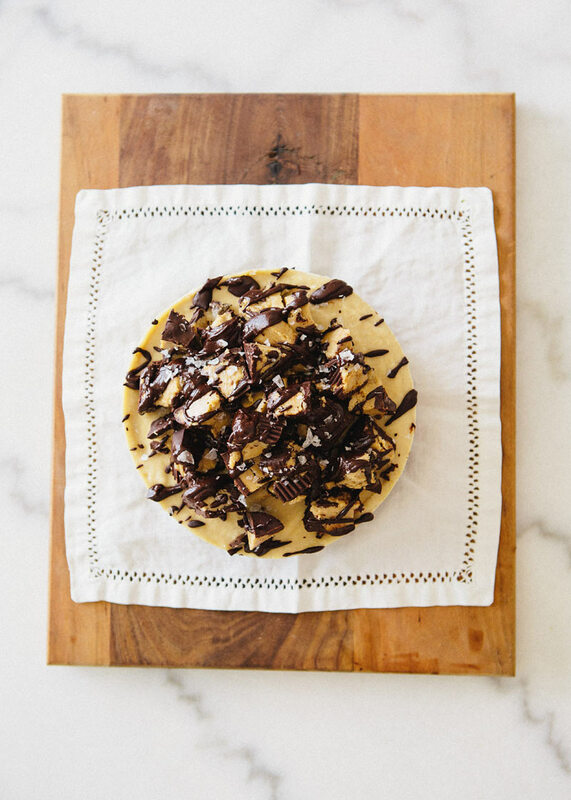 Set aside leftover chocolate to drizzle over the cake. Remove frozen cake and let sit for at 5-10 minutes before serving. 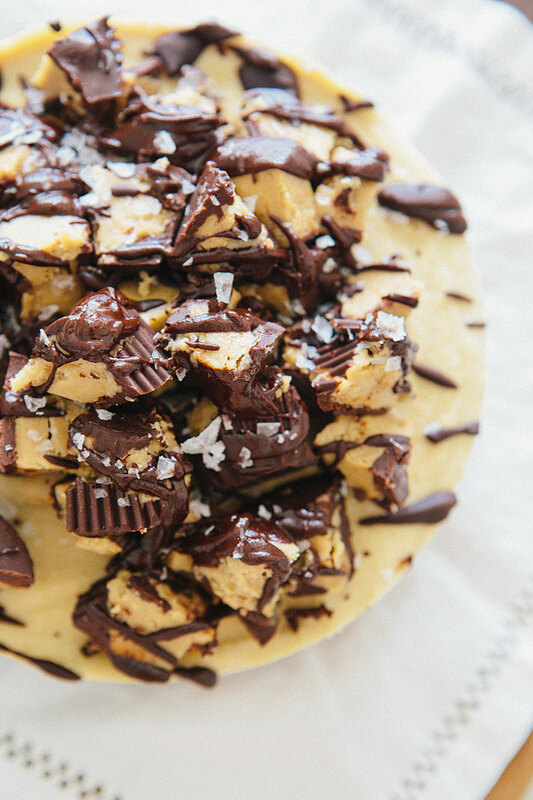 Chop peanut butter cups and place on top of cake. 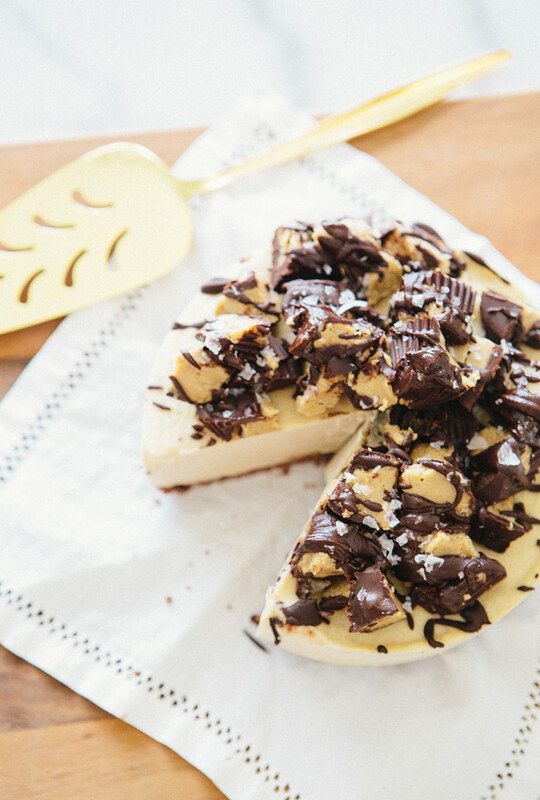 Use leftover chocolate from the peanut butter cups, heating slightly to melt if necessary, and drizzle over the cake. Sprinkle liberally with Maldon salt. Store leftover cake in the freezer. Don't be intimidated by the long list of instructions and multiple steps- this is really insanely easy to throw together and I think it's pretty much fail-proof! Just…wow. It looks so beautiful! I wish I had some kind of special occasion that would justify whipping up one of these cakes! Oh my! That looks absolutely delicious. I need to make it asap! I’m speechless. Um…yum?! Seriously yum. This looks so incredible! And the ingredients are so good. Next time I need to impress a skeptical vegan I’m coming to this dessert. Oh wow, this looks so good! I have to try this soon! Can´t wait to give it a try! Horray, I know you’ll love it Ale! Oh my goodness. 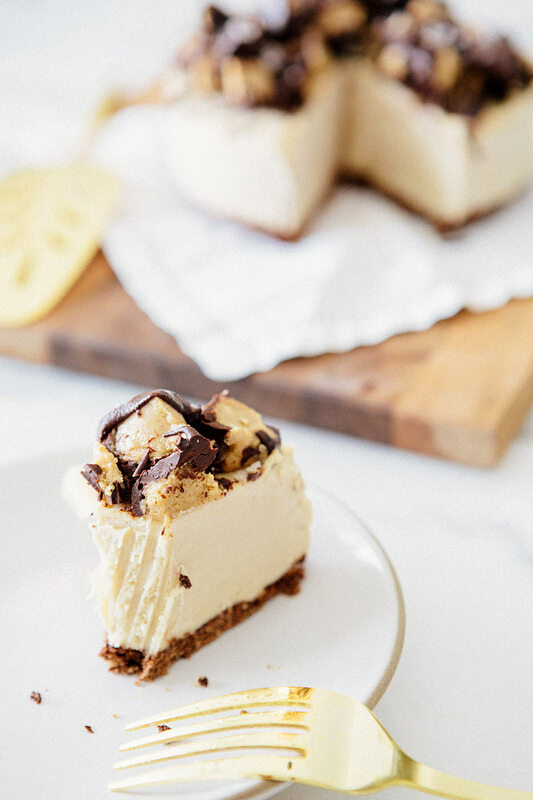 This is the best looking vegan cheesecake I have ever seen. I can’t wait to try making this! In your situation you are fully entitled to eat all the sweets in the world if that makes you feel better. The cake is beautiful and I hope so are your days. this looks PHENOMENAL. and i love the rice crispies in there. it’s a total win. These look delish! I can’t wait to try and make this for my family and friends. Can I ask what are you soaking the cashews in? 2 cups of cashews soaked for 3 hours. Soaked in what? Hey just wanted to say how amazing this recipe is. Made it for christmas – my first one dairy free! And WOW this was worth being dairy free for! When making the peanut butter cups I didn’t have mini cups so Blended the whole lot together and put inside greased muffin tray and refrigerated then grated them on top of cake. Have left over peanut cups to eat now (yum!!!!). Oh and soaking cashews: I just put them into a bowl and covered with hot water and then drained water off and put into blender then measured the water they were soaking in up to 1/2 cup as per recipe. Thank you for bringing some chocolate rich fun to my christmas! Made this recipe for the first time for my daughter’s birthday!!! Super easy and so delicious! Ps just because this hasn’t got dairy in it does not mean this is healthy!! Can I substitute something for the cashews? My daughter can’t have them.